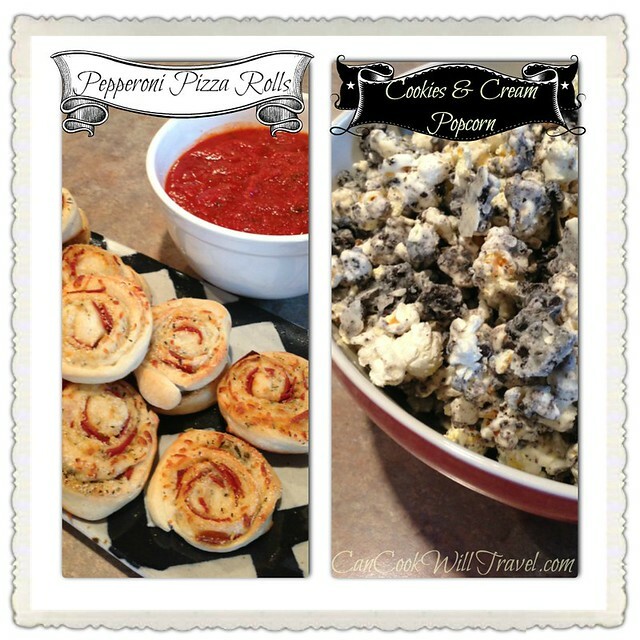 You are here: Home / Blog / Appetizers / Sweet and Savory Appetizers! It’s always a good idea to have some go-to appetizer recipes on hand when you need them in a rush. This week I was in that very situation. I had an event to help with and wanted to bring some great food to satisfy the group, so I thought I couldn’t go wrong with sweet and savory appetizers. Let’s start with the savory appetizer I tried out. I found it on the site Tidy Mom while looking at a different recipe I found on Pinterest…seriously, what did I ever do without Pinterest?! Back to the recipe, which was for Pepperoni Pizza Rolls. 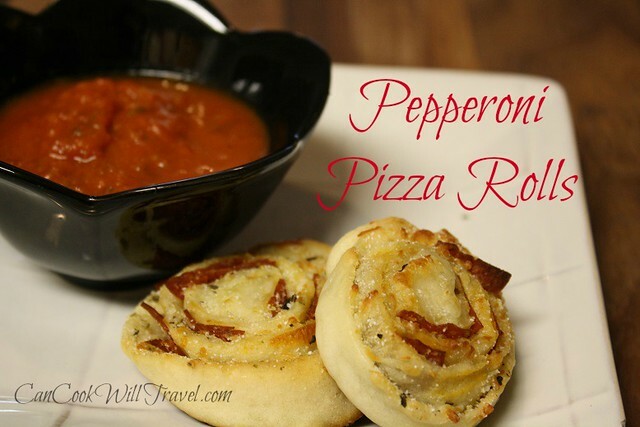 It’s pretty much what it sounds like, you’re rolling up a pepperoni pizza and then baking it. This pizza treat certainly comes together in no time. I began by chopping up a cup of pepperoni slices. Then I opened 2 cans of refrigerated pizza crusts and rolled them out and sprinkled the crusts with some garlic salt & Italian seasoning. Next a layer of shredded cheese (I went with a Mozzarella and Provolone), grated Parmesan cheese, and the pepperoni get spread over each crust. Then roll them up and cut into about 1-inch pieces. I lined 2 baking sheets with a Silpat and then placed each piece on the trays and baked them for 10-12 minutes. Now a piece of advice on these…they don’t travel super well. However if they are still warm and served with some warm marinara, they will be really delicious. I know this because the couple of leftover rollups I had left were really delicious. But if you do take them somewhere you might try to re-heat them and heat up some marinara as well before setting them out for all of the guests. I know I’ll be trying these out again. Yum! Click here for the recipe and step by step instructions. 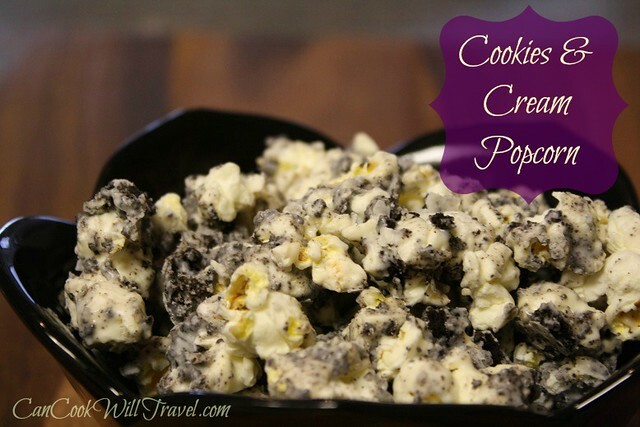 Moving onto the sweet treat…Cookies and Cream Popcorn…let’s take a moment, shall we? So I’ve only had this popcorn flavor at the movies (the fancy movie theater), and I was so sad when they stopped serving them in tiny cups before the movie. But now I’m no longer sad, because I can make my own! If you like popcorn, and you have even a tiny sweet tooth, then this popcorn will make your day. Everyone at the party was a HUGE fan, that might be an understatement. I think I heard some of them refer to it as “crack” – that’s a good thing, right?! It is in my book – haha! I had so many people asking for the recipe and let me tell you it was super easy. I got the recipe from a site called Chef in Training and it’s so simple you just won’t believe it. Let’s talk about popcorn for a moment. I eat a lot of popcorn as a healthy snack, and I use an air popper rather than popcorn out of a bag. So that was the type of popcorn I used so I can control what is on the popcorn. If you don’t have an air popper, then just buy plain popcorn with no added butter. You don’t want any extra flavors on the popcorn to overpower the awesomeness you are about to unleash. So you have your popcorn (I used about 9-10 cups of popped corn), and you will also need approximately 20 Oreo cookies, and 24 ounces of vanilla flavored almond bark. That’s it. Just crush the cookies. I used a plastic bag and a rolling pin to crush my cookies – super easy and not at all messy. Then melt the almond bark according to the package instructions. Once the almond bark was melted I drizzled it over the popcorn, tossed the popcorn and the bark, sprinkled the crushed cookies over the popcorn, and tossed everything together so each piece of popcorn gets coated. Then walk away and let the almond bark set up. Then dig in and I dare you to stop. It’s so good and was a big favorite at our event. Click here for the recipe and step by step instructions. I cannot wait for you to try this for yourself. So good! !